The Candela’s GentleLASE is the only laser that uses the Dynamic Cooling Device to protect and cool the skin during the laser procedures. 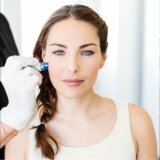 DCD maximizes patient comfort and epidermal protection by delivering a shot of cryogen to the skin prior to each laser pulse. DCD reduces the need for cooling gel and topical anesthesia, and permits for quick patient recovery. The GentleLASE has the largest hair removal spot size in the industry, and can deliver fluences up to 100 J/cm2. Winner of the Editor’s Choice Award for Best Hair Removal Laser. We will guide the laser to the treated areas with a small handheld probe. Each laser pulse may be preceded and followed by a short pulse of cooling spray. Depending on the area and condition to be treated, the treatment could take as little as a few minutes to as long as an hour. During the treatment, some patients may feel a slight discomfort, sometimes described as an insect-bite sensation. This discomfort is minimized by the Candela’s patented DCD cooling. 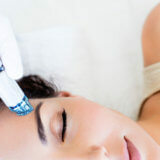 The number of treatments depends on the treatment you require and the condition of your skin. For hair removal, most people require an average of 5-7 treatments, as the process is only effective when the hair follicle is in its active growth phase. Click here for more frequently asked questions about Laser Hair Removal!